NOW A WONDERFUL HOTEL, it endeavours to engender the Edwardian house party spirit and has enough public rooms, nooks and crannies in which to sit and relax  be it with a good book or a drink. Surrounded by extensive gardens with a stream and ponds stocked with brown trout, there are ever more nooks and crannies to explore. Amongst and beyond is what is considered to be one of the top one hundred golf courses in the world. The hotel, regardless of the time of year, offers a truly exceptional array of both outdoor and indoor activities to keep young and old more than happy. Such country pursuits as shooting, archery, tennis and daily falconry displays are but just a few of the activities on offer. A popular choice with young children is feeding the hotel chickens and petting extremely docile pet ferrets  quite magical for city children. Everything you could possibly think of is available together with an enormous indoor swimming pool and beautifully indulgent spa. But if you just want to chill out and relax, well, there is a no better or more serene setting. And another claim to fame  the 'castle' was used in the first Hound Of The Baskervilles film. The rooms have been given the 'interior designer' treatment, organised by none other than the Duchess of Cornwall's sister, Annabel Elliot, who has retained the original Edwardian feel. Wallpapers and colours are contemporary with inspiration taken from the surrounding countryside but other guests felt that the bathrooms were a little too Edwardian. All mod cons are there: flat-screen televisions, very comfortable beds, classic furniture and complimentary dried fruits, water and hot drinks facilities. But the outstanding feature of our room was the amazing uninterrupted view from our window across the golf course up across the fields of the valley. So be sure to ask for one of the valley side rooms rather than one on the entrance side which, whilst it still features a woodland backdrop, does look down on the car park. A mixture of well-heeled professionals obviously in pressurised jobs with babies and young children, together with mature couples on luxury breaks. The men were taking the opportunity to play golf and the wives/girlfriends meanwhile taking advantage of the pampering on offer in the Spa. We must also mention a selection of very well behaved dogs and a wedding. A bona fide sanctuary with very friendly and unstuffy staff. On offer is everything from full-day treatments to a 'Golfer's Tonic' for rapid relief from tense, tight muscles  men, it would seem, have at last discovered what they have been missing and can be seen taking full advantage of the treatments. My blissful full-body massage, accompanied by the fragrance of frangipani, whisked me straight off to some tropical isle... Suki had me walking on air for a full three days. The spa was certainly a big highlight of our stay and, as you'd expect, there's also a gym, steam room and a very large indoor swimming pool. This is the future of luxury self-catering. In addition to the main hotel there are twenty-two self-catering lodges discreetly set amongst the manicured grounds. The design of the lodges was brilliantly conceived; these modern buildings fit in to the most sensitive of landscapes (a National Park no less) and with the hotel. The best materials, from stonework to textiles, have been used throughout and all have three en-suite bedrooms. They also boast fully-fitted kitchens, dining rooms and lovely sitting rooms. However, I would expect most guests would want to dine in the hotel as the restaurant prices were a pleasant surprise. There is a relaxed dress code for dinner (no denim!) and on a warm summer evening most men had removed their jackets and ties. The less formal Bistro is probably a better option for those with small children and offers more casual dining. We dined in The Edwardian Grill  a beautiful room with a hand-painted, Regency-inspired wallpaper: flowers, birds and butterflies. Foodies will be happy with the refined menu based on local seasonal ingredients. The memorable shrimp salad with glazed shellfish bisque was intensely flavoured and well balanced; the ballotine of quail and foie gras, with orange and green bean salad, was pretty and perfect for a warm summer's evening. My main course of John Dory was well executed although the breast of guinea fowl was somewhat bland and a little dry. Nevertheless, in spite of the menu reading elaborately you can expect nothing less than delicious cooking from a kitchen that knows how to handle quality ingredients. Forget the diet and try the bread rolls  and you must leave room for the puddings! 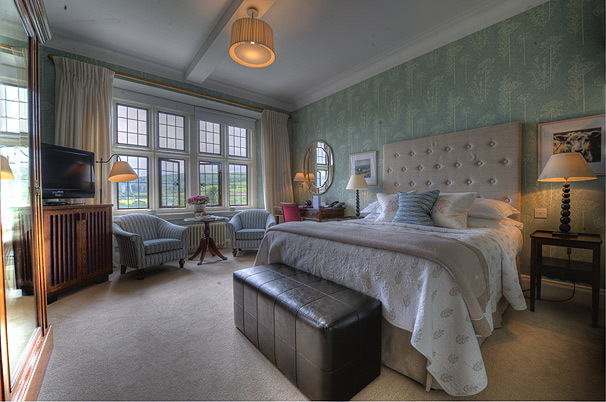 Bovey Castle is a great place to escape to when you need a break. The hotel is so relaxed and unstuffy, not only dog-friendly but children and families are genuinely welcomed. The staff, as would be expected in a five-star hotel, were all polite and helpful. We met two young teenage American girls enjoying being pampered in the Spa who said that 'In two whole days we have not been bored once' which perfectly sums up the hotel. 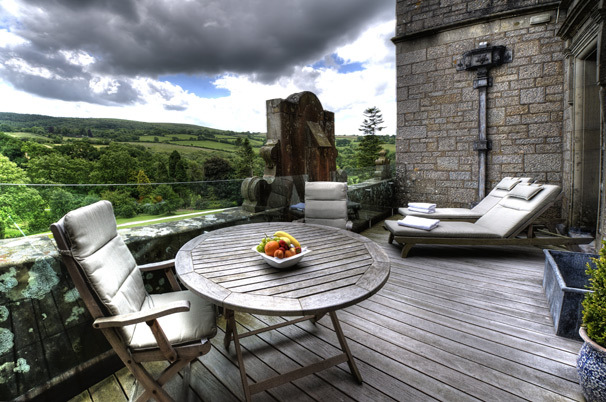 Bovey Castle, North Bovey, Dartmoor National Park, Devon TQ13 8RE. Tel: 01647 445000. Exeter St. Davids, the nearest railway station, is a thirty-minute drive away  the hotel has courtesy vehicles. 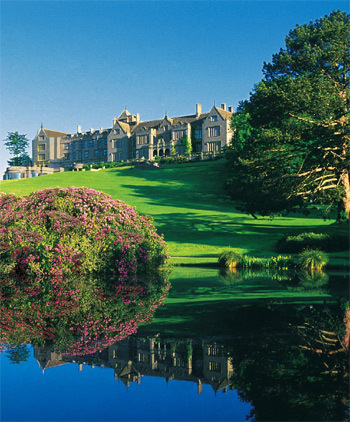 Bovey Castle is a member of the Small Luxury Hotels and Pride of Britain Hotels. Cothay Manor can be found after winding along miles of single track road 12 miles west of Taunton  and it is a worthwhile meander. This magical, romantic series of garden rooms surrounds one of the most perfect examples of a small classic medieval manor. Many garden rooms (each a garden in itself), a river walk and a plantsman's paradise. There is also a small caf� serving light lunches and refreshments. If you only ever visit one garden in your lifetime, this one should be it. More than worthwhile to make a special detour. Cothay Manor, Greenham, Wellington, TA21 0JR. Tel: 01823 672283.